It is getting to be soup and stew weather again. If you have been following my blog for any length of time you know that I love to make to soup. It is economical and feeds a multitude of people. 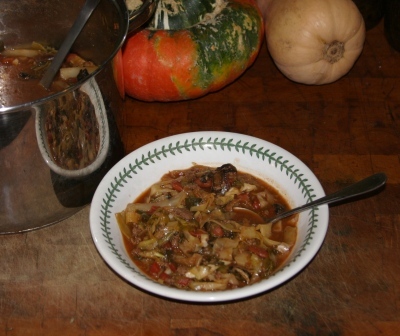 I found the base recipe for this stew over on a frugal living website. I have added a bit to it just because I wanted a different flavor. The original soup used ground beef but I had ground venison in my deep freeze. Not having to buy the meat protein makes this a cheap and cheerful way to feed the family. In a large soup pot, brown the ground meat with the salt. Add all other ingredients after the meat is fully cooked. Add more water as needed to bring to a stew constituency. Bring to boil, reduce to a simmer and cooked covered for at least 45 minutes. Serve with a country style loaf of bread. This entry was posted in main dish, soup, stew and tagged beef, bison, cabbage, fall harvest cooking, garlic, mushrooms, venison, wild game. Bookmark the permalink.